Volcanoes are a constant, natural source of carbon to Earth’s atmosphere. However, scientists remain uncertain of just how much volcanic carbon, mostly in the form of carbon dioxide gas, is released over time. Directly measuring the gases constituting volcanic plumes is challenging, both technologically and physically. Recent technological advances, including higher instrument sensitivity and more portable instrument size, help scientists more easily detect volcanic CO2 signals above the atmosphere’s background, but volcanic peaks remain inhospitable, remote, and often dangerous places to work. In September 2015, several DCO scientists took part in a US NSF sponsored GeoPRISMS expedition to the Aleutian Islands onboard the R/V Maritime Maid. DCO DECADE (Deep Carbon Degassing) scientists Taryn Lopez (University of Alaska Fairbanks, USA) and Tobias Fischer (University of New Mexico, USA) focused their work on the Western Aleutian volcanoes, and in a new paper in Geophysical Research Letters they report the results of their airborne measurements of carbon chemical and isotopic composition emitted from Kanaga volcano . Fischer and Lopez conducted ground-based campaigns at several of the Western Aleutian volcanoes, but at Kanaga they were able to make the most of helicopter time and test a new technique to sample plume gas from an airborne platform. Through a series of fly-bys of the volcano plume, they collected several plume samples at distances of up to 5km from the summit. 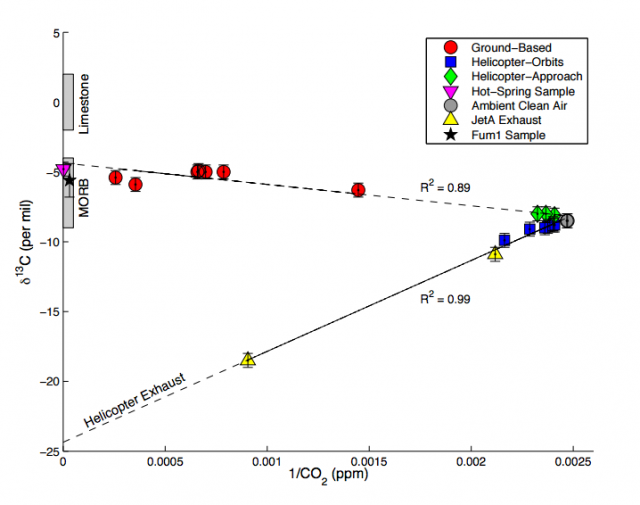 This kind of sampling for carbon measurements is novel, and complicated by the fact that even small amounts of helicopter exhaust can obscure the data. However, by analyzing the plume samples for carbon isotopes and comparing their data with that of ground-based measurements allowed Fischer and Lopez to mitigate this contamination and extrapolate to the carbon isotope composition of the volcanic source. One of the major questions they set out to answer was how much of the carbon released from the Western Aleutians originated in Earth’s mantle. Arc volcanoes differ from hotspot and rift volcanoes because they occur at convergent margins where one tectonic plate subducts beneath another. Because arc volcanoes sit atop this area of crustal recycling, a significant portion of the carbon released through arc volcanism is from the subducted crust and sediments. Using a new spectrometer, the Delta Ray, developed by Thermo Scientific and generously loaned to DCO, Fischer and Lopez detected a carbon signature indicative of predominantly mantle carbon. This instrument is particularly useful for field researchers since it is portable, allowing near real-time analysis. Such timely information allows researchers to quickly evaluate the sample compositions and if needed make last minute changes in the field sampling tactics. “By measuring the variability in carbon isotopic composition and flux along the length of the Aleutian Arc we hope to determine how subduction parameters influence the origin and amount of carbon released to the atmosphere,” said Lopez. The team is currently in the process of completing the analyses of gas samples collected throughout the Western Aleutians to obtain a complete picture of the gas sources and fluxes of these remote volcanoes. Diagram of δ13C versus 1/CO2 measured from Kanaga's plume throughout the study period, along with reference compositions and binary mixing lines. Measurements acquired from ground-based, helicopter orbit, helicopter approach, the hot spring, and JetA Exhaust were performed by Delta Ray. The direct fumarole gas sample was analyzed by IRMS. Reference compositions including MORB, limestone, and clean air are shown. Adapted from Fischer and Lopez 2016.